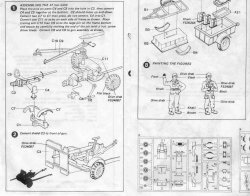 or: The Ongoing Search for a Decent US 37-mm Anti tank Gun! For those who know me youll know I have a thing for small-scale artillery; such an important part of history and known for creating more war casualties this past century than any other weapon I believe. This is actually a partial-kit review. 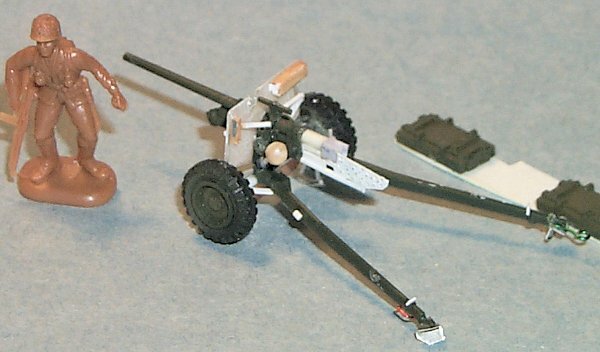 This small-scale towed anti-tank gun is part of a combination kit consisting of a decent 1/72 scale 4x4 ¼-ton Jeep, a small trailer two-wheeled and this gun. The Jeep scales out pretty much the same size as the newer Jeep release by Academy, though not as refined. The trailer is good and the only offering of this trailer in the scale I am aware of. The gun, unfortunately, bears almost no resemblance in shape and detail to real thing though. I dont know what Hasegawas engineer was shooting for, but a US M3 gun it is not! 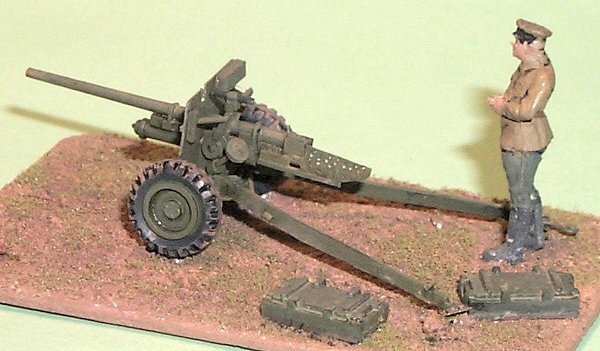 As a wargaming piece it is more acceptable in that it is easy to assemble and looks like a US 37-mm gun. As a display model its a good start but needs some scratchbuilt detailing. Below is a US government photo of the 37-mm M3A1 version for reference of the breach area. According to Ian V. Hogg, in his book Allied Artillery of World War Two, in the early 1930s the US Army had little in the way of anti-tank weaponry. 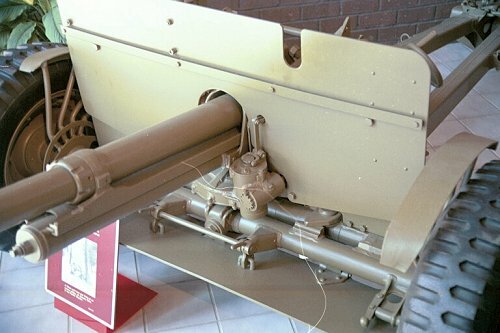 In 1937 the US acquired two German 37-mm Pak 36 AT guns and used these as inspiration to produce the M3: a new weapon with a vertical-sliding block breech, split trail and a hydro-spring recoil system; and weighing only 912 lbs. (414 kg). Compare this to 1757 lbs. 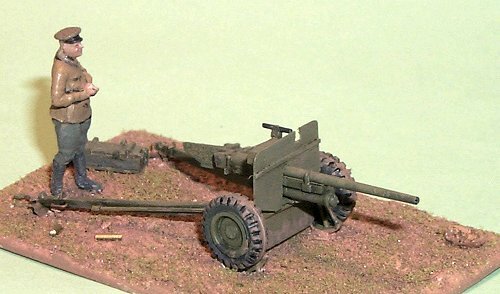 for the British 40-mm 2-Pdr gun, 510 to 620 lbs. for the Soviet 45-mm guns, and 950 lbs. for the German 37-mm Pak 36. It initially could penetrate 36-mm of armor @ 460 m (500 yd. ), later increased to 61-mm @ 460 m with APC shot (against vertical armor plate). Though acceptable by 1939 standards, the gun was pretty much obsolescent in Europe by 1941. It remained effective against Japanese tanks throughout WW2. 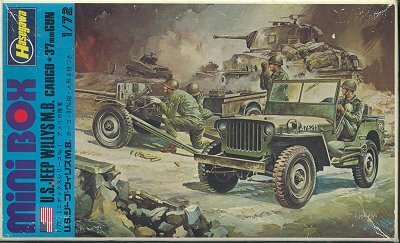 The M3, and later M3A1 guns served much of WW2 but were eventually replaced by the 57-mm AT guns. 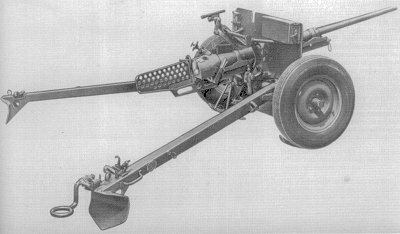 The M3A1 gun could be found in self propelled mounts and was modified for use in the M3 medium, and M3 & M5 light tanks. In the above photo of the kit parts: at far left is the gun trails and carriage assembled as per kit instructions. At far right is the new scratchbuilt carriage, axles, and new breach attached to the Hasegawa barrel. In the center is the scratchbuilt shield made from clear styrene sheet (stiffer than regular Evergreen sheet of the same thickness) and the larger wheels borrowed from Hasegawas trailer kit. The wheels and tires are fair in detail and may be best replaced by Academys Jeep wheels for enhanced accuracy. In the center, still attached to the sprue is Hasegawas gun, which is reasonably accurate from the muzzle on back to the hole. An odd thing that Hasegawa did was to design the skids, or supports that are on the inside of the wheels and treat them as fenders. This mistake necessitated that they make the wheels smaller than actual. These supports are visible in the US Army photos above and below. The support consists of three legs and a round base that when lowered raises the wheels slightly off the ground and takes any weight and firing shock off the tires. In the instructions below, these supports are listed as parts C7. I wont get into all the detailing and corrections performed on the model but I will say that at one point I stopped, otherwise all parts could have been substituted and then it would no longer be a review of the Hasegawa kit. An odd feature of the kit I chose to live with is that the trails have a camber (curve) to them and they are wedge shaped in cross-section, AND after assembly the wedge shape for one trail points down and the other points up. At a recent model show a judge, mercifully unfamiliar with this model, assumed that I installed one trail upside-down and faulted me on construction! Above is a US government photo of the petite 37-mm next to its very big brother 3-inch AT gun. Markings came for the trailer and jeep though none for the gun. In the period photos I have seen of this diminutive gun I have noted no markings such as unit designations or kill rings, etc. The color was a standard olive drab though I bet a brown camouflage pattern is possible. The inside of the breach was typically bare metal. Tires should be dark gray to represent scale-effect black. Overall a poor model of the real thing but an okay start to scratchbuilding a more accurate gun. Hasegawas plastic took paint and glue well. Even though thousands were built (perhaps more than the German 37-mm Pak?) I have found little good reference material compared to those books covering German anti-tank guns.